My friend’s little girl turns three at the end of the month. During a recent holiday, I made her this little number: A little shoulder bag with a kanzashi flower detail, plus a matching scrunchie to go inside. If she doesn’t like it, I’m sure her Mum (for whom I made this previous creation) will use it instead! As I was away from home, I took the materials (fabric, scissors, sewing kit) with me and made it all by hand. First time I’ve made a bag without a sewing machine! When I got home, I added on the velcro and strap. Again I hand stitched it all. I rather enjoyed making it and am pleased with it. I used to love these as a kid. I remember my Mum used to make them quite frequently and I’d sometimes help her. I can still remember some of the scrunchies I enjoyed wearing as a little girl. My favourite was a slim one made out of purple silk which we picked up in some kind of industrial fabric shop in London. It was very soft! I also had one (that Mum) made out of some rather scratchy material which looked great due to its wacky and unusual colours and sparkle, but wasn’t the most comfortable to wear, which my Mum picked up in Hong Kong after a sad family funeral she went out there for. 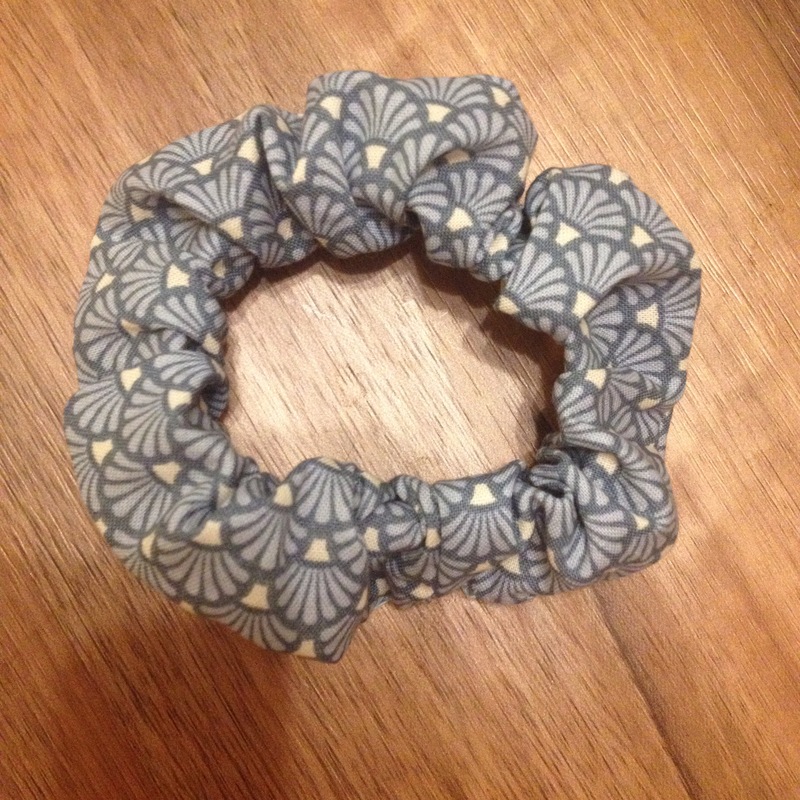 These scrunchies bring back memories! I’m not sure how often I’ll wear this one, but I was inspired after reading this article on the Guardian online. All linked to a new film out- I Tonya. Well, if scrunchies do defy the odds and make a big comeback, I know where to turn for mine. Or how to make some more. You can too, I followed these easy to follow tutorials: here and here. The first one is quite simple. At first I liked the little videos that play automatically in the second, but then I must admit they made me feel a bit seasick. More likely that I’m still recovering from a virus that has wiped me out all week. Bye for now! PS Next time, I’m going to have to do a better job of learning how to ladder stitch/ do an invisible stitch to sew up the opening. I’ve never quite got the hang of it!